DNP, known as the world famous dye sublimaion ink ribbon manufacturer, has developped the ink ribbon for DNP CX-series card printer. 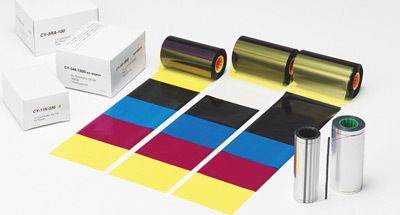 Unique, and lateral card-conveyor system makes the ink ribbon's capacity largest in its class. In addition, RFID tag installed in the ribbon enables you to check the status such as ribbon type and remaining amount on Status Monitor at sight.